All about the original garden and how it was recreated. 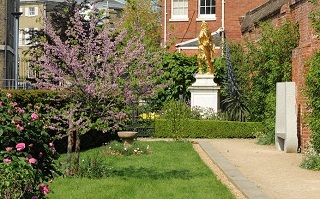 The present day Porter's Garden was opened on 21st June by the Lord Mayor of Portsmouth. Since 2000, and continuing today, the Friends of the Garden have recreated and maintained it using many traditional methods and plants. The original garden was first created over 250 years ago. It is feautured on a 1754 map. In the intervening period the area occupied by the garden was used for many purposes - at one for police cells and later for an air raid shelter. The Friends have discovered four eighteenth century maps of the Porter's Garden. This map of 1754 shows his house, stables and two small trees in his garden. 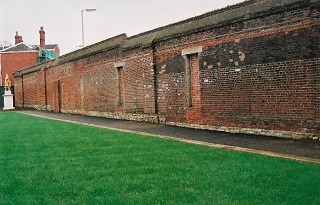 The dockyard wall - the garden wall - was built in 1711, so that 'Ill disposed people inclineing to Purloine, are shut out from doing hurt from the Land'. It also defined the boundary of the Porter's garden. The gate provided the setting for many embezzlements and a dramatic labour dispute in 1743. It was also used to publish regulations and invite tenders for dockyard contracts and outside projects, such as St George's Chapel, built in 1753 by dockyard shipwrights and house carpenters. The Porter's Lodge was built in 1708 and until very recently was thought to be the Dockyard's oldest surviving building. 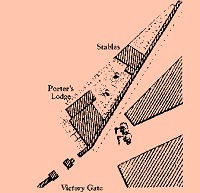 An earlier Porter's watch house stood at the gate in 1698. 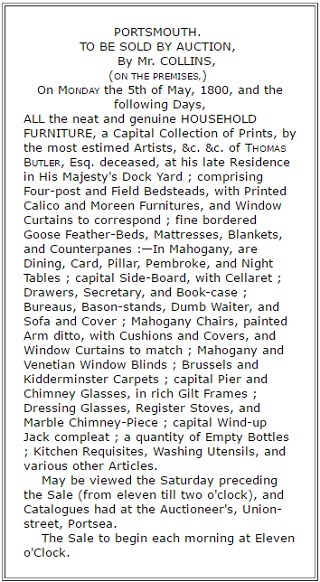 Other dockyard officers, whose gardens survive, lived in the Commissioner's house and Long and Short Rows. This building is Grade II* listed, under the Planning (Listed Buildings and Conservation Areas) Act 1990 as amended for its special architectural or historic interest. Two porters lived in the Porter's Lodge from 1739-1800, William Woodrow (1739-1780) and Thomas Butler (1780-1800). The porter had three functions. He guarded dockyard boundaries and property and marked working hours by ringing the muster bell and closing the gate against latecomers. To prevent excessive theft of timber, 'chips', he allowed 'no Person to pass out of the Dock Gates with great Coats, large Trousers or any other outer dress that can conceal stores of any kind.' He also sold beer to the men 'to enable them the better to carry on their labour and not to distemper them'. The Porter's life is revealed through his job and outside activities. In 1753, described as a 'Gentleman', Woodrow was one of the original pew owners of St George's Chapel, owning one of the larger pews on the ground floor costing £30. He was the public face of the dockyard, the daily interface between the inside and outside communities. On the left is the "Notice of sale of effects of Thomas Butler" taken from the Portsmouth Telegraph. 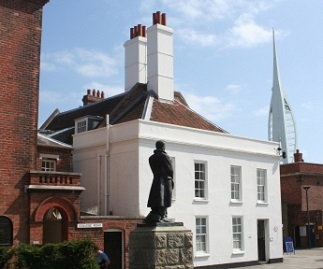 For the millennial 'Renaissance of Portsmouth Harbour', in 1998 Portsmouth Naval Base Property Trust commissioned landscape architects Camlin Lonsdale to design a new garden on the site of the former Porter's garden. During the twentieth century the site had been used for police cells, the Police Superintendent's Office and an air raid shelter, so it was an architectural confusion. Hampshire Gardens Trust and local residents were consulted. 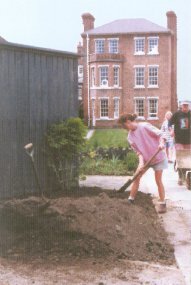 In Spring 2000 a Friends' committee was set up. The Friends visited local gardens to plan its design and planting, mindful of soil, aspect and rainfall. Hampshire Gardens Trust, Brian Kidd, Portsmouth Parks Environmental Officer, Petersfield Physic Garden and Staunton Country Park all helped and gave advice. 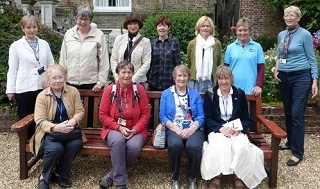 Today's Friends look after the upkeep of the garden and can be found volunteering come rain or shine, every Wednesday, and on the first weekend of every month. There is always lots of work to do : Weeding, planting, trimming, mowing the lawn, topiary, and preparing & pricing plants for sale are just some of the jobs. Regular meetings are also held in the Porter's Lodge. The Friends are also active in improving the garden and establishing new features. The garden's Twitter account is regularly updated. Four walnut trees, yew and box hedges form the garden's main features. The Royal Navy has contributed two statues. At the entrance is Captain Robert Falcon Scott's statue sculpted by Kathleen Lady Scott in 1915. It commemorates his heroic attempt to reach the South Pole and death in 1912. To the east is William III 'finished in the manner of the Cæsars,' sculpted by van Ost and presented by Richard Norton in 1718. William's wars against Louis XIV led to the expansion of Portsmouth dockyard in the 1690s. He was also an enthusiastic gardener. Beyond is the stone found lodged in the hull of HMS Pique which ran aground in Labrador, but successfully crossed the Atlantic in 1835.